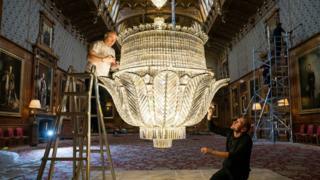 Windsor Castle is undergoing a two week spring clean before it is re-opened to the public over the weekend. Experts ensure the castle's State Apartments are cleaned from floor to ceiling during what the Royal Trust calls the annual "high clean". Chandeliers dating from 1862 and commissioned by Queen Victoria are dusted, along with suits of armour on the Grand Staircase. The castle will open its doors again to the public on Saturday.